So it's finally over. After almost eight months of rumors, speculation, denials and predictions, you're finally back. You're a Vancouver Canuck. Here's the deal. You screwed up at the deadline, and deep down I think you know it. Your indecision over the summer was embarassing. When you still couldn't make up your mind as the season wound on, it became pathetic. Right or wrong, you've looked like a guy who didn't care about winning. Right or wrong, you look like a flip-flopper at best, a liar at worst. Right or wrong, your "full journey" quote has already become a symbol of athlete hypocrisy. Right or wrong, you've looked like somebody who'd rather go into hiding than answer a few tough questions. You brought all this on yourself. You, and the people around you that have been giving you such terrible advice through this whole sad saga. You've worn us all down. I'm tired of writing about you. So here are my parting words to you: Good luck. I hope you win a Cup. Really. I hope you go out and play the best hockey of your career. I hope you lift the Canucks to the top of the league, take a nice long skate with the Cup, then retire. I hope you head home to Sweden, enjoy your well-earned retirement, and we see you again at your hall-of-fame induction. Because that would make a happy ending for this whole ordeal. And after all these years, you deserve at least that much. It hasn't been fun watching you embarass yourself over the past year. 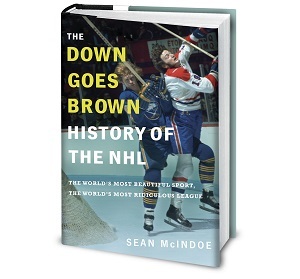 Leaf fans deserved better from you -- hockey fans deserved better from you -- but we didn't get it. Fine. But what's done is done. Now it's time to look forward. And it's not hard to see a lot of ways this could end badly. You could get hurt (you're 38, and who knows what kind of shape you're in). You may not have the competitive fire anymore (after all, it took you this long to decide you still wanted to play). The Canucks could fall short when it mattered (since they're, you know, the Canucks). You could be headed towards your Jerry-Rice-as-a-Seahawks stage, your Michael-Jordan-as-a-Wizard days. And if that happens, everyone will line up to bury you. And that's not what I want, because right or wrong you're a Leaf for life. Sure, go to Vancouver as a rental (cough). They'll embrace you if you win. If not, they'll cut you loose and move on to the next savior. But either way, when it's all over your number is going to be hanging in our rafters, not theirs. You'll be the guy whose name is all over our record book, not theirs. Your career highlight package will have a blue maple leaf all over it, not whatever the Vancouver logo is this week. So I hope that highlight package has a happy ending. You should have won a Cup in Toronto, but that didn't happen and towards the end we all knew it never would. So be it. Now you've painted yourself into a corner where anything short of a Cup in Vancouver will be a failure, and the knives will come out. Part of me might enjoy that, but it's not what I want to see. Because you're a Maple Leaf. You're part of Leaf Nation. You're one of us. Even if at the end you didn't want to be. If you need to win a Cup to redeem yourself, then I hope that's exactly what you do. This isn't the way it was supposed to end, but it's the best option left. Go make it happen. Thank God he didn't sign with Montreal or Ottawa. Then again, yoiu don't have to live here. Great post(s). Well said, DGB. Well said. I left a similar sort of sentiment at Cox Bloc like yours DGB. To be honest, I think most Leafs fans are just worn out over this whole situation (debacle?). Sure, some have the energy to still verbalize and feel a visceral hate. But you know what? I'm tired. So, Mats, you do your thing. I'm not going to boo you or cheer you. I'm ambivalent about my feelings for you. Funny enough, I can't think of a better way to capture this new chapter of your career: undecided. A great article. Mats is a god but right now it feels like he has forsaken us. I'm pretty shocked that he signed for Vancouver, because I thought he would go to New York for sure. I guess the money was too good. Plus it means he only has to play us once. i don't think he's embarrassed himself as much as you do, but otherwise, well said. and because i have no friends or family that are canucks fans/leaf-haters, i can actually cheer for him and mean it. maybe he'll help vancouver win their first cup and that pathetic excuse for a franchise will actually have something to be excited about. also for what it's worth... playing 50 games with a team from mid-december on isn't the same as being with the team from training camp, but it's also not the same as playing 18 games with the team after the trade deadline. Nice post. My feelings were similar, but I ended up going the other way. I want Vancouver to fail miserablly and for Sundin to regret ever considering anything other then being a Leaf. I'll forgive Sundin, I just want him to learn a lesson about loyalty first. MAts is a great player and will add something to the Canucks....Always good to have more Canadian teams in the playoffs. However, it isnt worth cutting hom any slack over what you call a PR statement, I would call a lie. He lied to us....he is just a hockey player so who cares. Just remeber that the next time the next "saviour" comes along and claims to only want to be in Blue and White. It might be true, it will just mean a little more if if doesnt have a NTC and isnt in the last year of a contract. Glad the lot of them are gone...rebuild the clubhouse. Yeah, well done. I'd rather have seen the Leafs pick up some prospects and picks last year and actually been able to cheer for him. Now I'm still pissed at him for all the reasons you've already listed and would prefer to see him fail. He had his chance at having Leaf fans back him, now piss on him. If he cared he would have taken the hint when we all asked him to leave. General, you want Sundin to learn a lesson about loyalty? Oh my God. Just when I thought I've heard it all. The general has a fair point. Mats was well paid and granted lots of concessions, so one hardly needs to believe he ever sold his services for anything less its market value. Some might even argue he got a premium for being in Toronto. Point is where did Mats display loyalty to the Leafs. The only time he was ever asked to take one for the team, be moved so the Leafs could get a prospect, he declined...as was his right. I will say loyalty discussed on either side is a ridiculous concept. 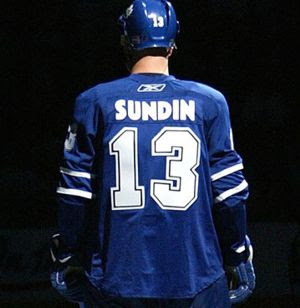 It is a business where players like Sundin make more in a year than most people make in a lifetime. Nonody is trading in loyalty here, neither side. What I dont like is the lack of honesty. Mats may feel close to the city, or the team, but he sure put the lie to it by becoming what he said he didnt want to be. No kid gloves are required. He was a great Leaf, it remains to be seen if he will be a great Canuck (I suspect he will). I just think the less he says about this the better, since he essentially lied last year. Brown might forgive him for just speaking what his PR agent told him, I give Mats more credit than that and assume he is capable of filtering the advice he is given, he is responsible for his own actions. Mats Sundin lied to the fans, just remember that the next time a player getting his full market value claims he is doing something in his interest because he really is doing it "for the fans". As for his new claim that he wanted to stay in Canada....lets put that BS to rest...there are tax reasons for him to want to stay in Canada. So Mats, stop lying and have a great season.